Gourmet at home for a fraction of the price! Serve this elegant entrée for date night or a dinner party that will leave your guests chatting for days! Lemon Infused Olive Oil is being used and can be purchased on-line at Spicewood Food Company. 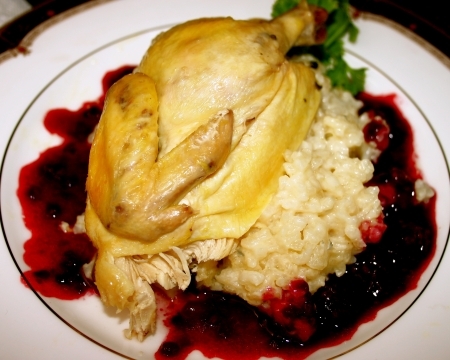 Cornish game hens usually can be purchased in a package of two in your freezer isle and one hen will serve two people. Ingredient amounts will serve 4. Remove anything from inside the hens and rinse. Stuff each hen with any fresh herbs you have available from the suggested herbs on the ingredient list. About 2 sprigs or more of each of any of the herbs listed. Be generous on stuffing the herbs into the cavity. Place both hens into a large baking dish, sprayed with non-stick cooking spray, breast side up. Drizzle lightly with lemon infused olive oil and a sprinkle of kosher salt. Gently turn each hen so that breast side now is down. Cover and place into a preheated oven at 375 degrees for 75 minutes. While hens are baking, heat olive oil in a large deep skillet over medium high heat. Add onion and sauté until translucent. Add risotto and garlic and sauté for about 1 – 2 minutes. Add wine and stir. Begin to add a cup of the broth at a time to risotto until absorbed, stirring frequently. Add gorgonzola, boursin cheese and salt half way through process, stirring to make sure all well combined. When done, liquid should be absorbed and risotto should be tender this process takes about 30 minutes. Turn heat off and let sit while preparing the sauce or serve immediately. Don’t let sit for over 20 minutes or it will be sticky. The sauce can be made simultaneously while making the risotto. Heat olive oil in a medium sized sauce pan over medium high heat. Add shallots and sauté until slightly browned. Add blackberries and port and stir. Bring to a boil and reduce by a quarter, about 2 – 3 minutes. With a potato masher, try to mash the blackberries into smaller pieces and stir. In a small cup whisk cornstarch and water to make a thickening agent. Bring the blackberry sauce to a boil and gradually whisk in cornstarch. The sauce will not thicken until brought to a boil. Whisk in butter, turn heat off and cover to keep warm. Once hens are fully cooked, remove from oven and let rest for 10 minutes tented with foil. Cut hens in half. Place a scoop of risotto onto a dinner plate, place the halved hen on top and drizzle several tablespoons of the sauce around the risotto to create the above presentation. Try Franciss Coppola Black Label Claret (California), Becker Vineyards Claret (Texas), Rodney Strong Pinot Noir (Califronia), Dr. Pauly Bergweiler Bernkasteler alte Badstube am Doctorberg Riesling Spätlese (Germany) or Samuel Adams® Blackberry Witbier(Boston, MA).